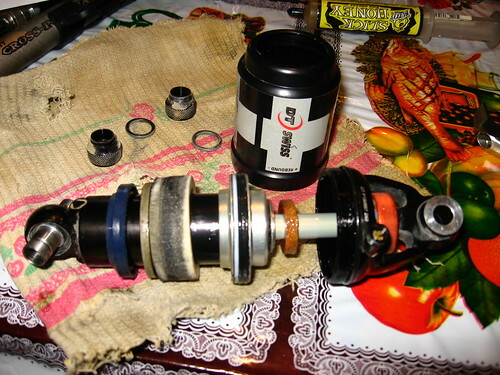 I replaced the seals and regreased the insides of my rear suspension (DT Swiss SSD 225 air shock) yesterday. Fantastic shock by the way. Not a hint of dirt or wear inside. This is the first time I have serviced the thing in 7000km. The Lizzard Skin suspension boots have played a large role in this I think. 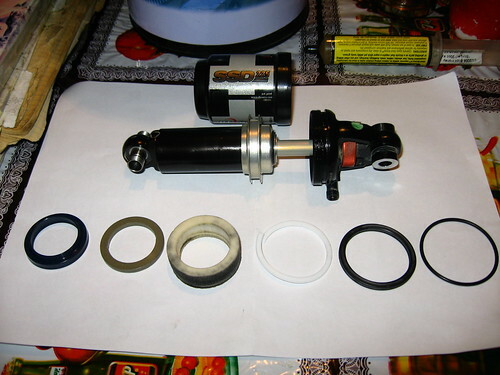 They keep all the dust, water, and dirt off the shocks, so wear on the seals is decreased. Just wandered back from watching some floppy being dragged from the thames. Not a good way to start the day, snow and taking the best and only mode of transport all to bits. You'll be there for atleast a week, I would never take it to bit for fear of not getting it back together again…. I need a beer and it's not even friday yet! Thanks for sharing your ongoing journey with us! Say, I read something today that might help you. (You might already know this, but just in case…) You were wondering a couple months ago what might have caused all that diarrhea… overtraining/overexertion can cause it along with all the other reasons you thought of. "Chronic diarrhea or heartburn can mean that your system is so overworked by riding that it can't process food properly." Ben Hewitt, New Cyclist Handbook. You can track your waking heart rate and if it is higher than normal, you might need to take an extra day off. 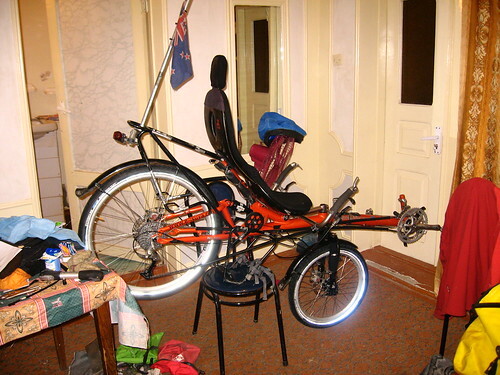 By the way, you sold me on the idea of a recumbent. Too bad I and my wife just bought uprights. Andrew, thank you for the insight into my 'digestion' issues. After a course of Flagyl, the giardia has been taken well and truely care of. However I do still have a niggly heartburn issue which could very well be due to over exertion. I hope with some flatter roads for a while that this will sort itself out. I guess I'll just have to take it easy and see. I think I might be suffering from seasonal adjustment dis-order, all I want to do is win the lottery, sit on a sunny beach looking at distant vista's, no mobile phone and a few ice cold beers. That's not that much to ask is it? Rob, glad to see you are still making good progress. I have enjoyed following your exploits. I was a bit taken aback by some of the comments in regards to Canada and thermal underwear by individuals posting on the previous entry. Just to set the record straight we have not as yet had to break out the "longjohns". It's only -20. Maybe tomorrow when it hits -30…..
Samarkand under the snow is very surprising to see considering that it was so sunny a week ago! here in Paris it is grey, I just reached 24 years old, but I am still trying to cope with the jetlag; feeling sleepless and restless. they also say lemon tea not too hot without sugar in the morning is good for heartburn and reflux. Personally just get wound into some pharmaceuticals and enjoy the side effects! got to go lottery closes in 20 mins and I'm feeling lucky! A pity you've got to get to Azerbaijan to uplift your winter gear. Just as well you had your thermals with you! If the snow stays around I guess you'll be training to Tashkent rather than biking. Enjoy your break and listen to what your body is telling you! Although Giardia is very easy to pick up even in 'pure' mountain streams. rob, i saw a bike once where the rider had placed screws on the front tire and sheets of sheet metal on the rear. sounds perfect for riding on ice, and they reached some fantastic speeds down the hills, although the bad news was that his friend managed to tear himself a new hole in his rear end on the back wheel, and get flown down thanks to ACC. oops! good on ya mate! keep plowing on! damn it! again no prize cigar for me! I'm sure the lottery is fixed…. reading some of the other comments i would say there are no pure streams unless it's in a sealed bottle, been boiled to hell and back or has more iodine in it than betadine don't drink it. In some army units (not that I know anything about it) they have a teaspoon full if iodine as a evening snack just to make sure. I must say it worked when I was out in the sticks cos everyone else was sick but i stuck to my diet of Iodine and rum. got to go Physio tomorrow. I had this crazy thought that i hadn't heard from you in ages… and here you are! WOW!! hope that all is going well still and you are loving it. I am heading back to NZ on the 6th of Dec for a 3 week break with Pete. He gets to meet all the friends and family, so will be fun. Well impressed with your website, and I must remember to check it more often. Keep it up mate, your a LENGEND! Rob… You're a legend. I always knew you would do something big one day but this is BIG! I've just spent 3 and a half hours looking at everything on your site on my day off (the first in a very long time)and what you are doing is beyond words. Rachel was down in the weekend and told me about this site. We are both suitably impressed. Take care. I'll keep checking on you. Jean, thank you for the advice. Almonds are relatively cheap here, so I'll shoot down to the bazaar today and see what I can find! Doug, Canada rules. I would love to try cycling in cold weather like that. May need some spiked tyres though I suppose…and of course some two-ply long johns – good Canadian quality! Bob, thank you for your message. I don't suppose your kids have a website that details their driving journey across Russia? Matt, just wait for it – my back tyre is getting a bit thin – a perfect excuse to have some fun with the wood screws. Kathryn, this is all fairly small when you look at what I do every day – sit on a bike and pedal until it gets dark. And on a recumbent, it isn't much like work at all! I have read through your blog with my 5 year old son and to him you are as cool as Spiderman, NASA and Lego combined! seeing you go through so much snow is really amazing… did you have any idea that the weather would be like that before you took off? and have you checked if some of the countries you will pass through use salt to melt the ice on the roads? Salt is a real bike part killer… beware and have an excellent trip! As for the snow, the original plan was that I would be in Switzerland in winter time. I'm about three months behind schedule, so that's why I ended up getting stuck in the snow in Turkey and central Asia. As for salt on the roads…the truth is that I do very little research onto the road conditions before I go. The answers I get when I do are usually wrong anyway. Adds to the fun! Daniel, I dunno. Perhaps you are. There was some fairly intensive comments on comments regarding monarch butterflies the other day, that's for sure. ← Day 122 – Snow in Uzbekistan?